The 1999 Harley FatBoy for sale has Dual driving lights on front like a Harley Softail Heritage, Vance Hines Straight Shot Exhaust Pipes and a detachable windshield. The 1999 Harley Davidson Fatboy also has LOTS of chrome. 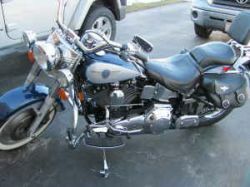 I have pictures of the 1999 Harley Davidson Fatboy available on request. GoGoCycles encourages our visitors to write a review of the Harley for sale in this ad to help those who might want to buy make informed decisions. Please mention that you found this nice bike on GoGoCycles Used Motorcycles for Sale when you call the owner! E-mail for pictures of the 99 Fat Boy and don't forget to mention that you found this ad on GoGoCycle's Used Motorcycles and Parts for Sale www.gogocycles.com. The 1999 Harley Fatboy for sale is located in Tallahassee FL Florida and my asking price is only $5900 FIRM (the dealer's motorcycle blue book value is 8,300 so I cannot go below 5900).